The theme I am using for this box is the notion of self-exploration. Society has become chaotic and volatile. One must look within and access their own position. It is only then can one figure out their meaning in the scheme of things. The theme depicted by the box represents a journey. This incorporates the spiritual, the physical, and psychological dimensions. 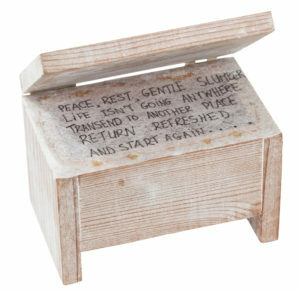 The function of the box serves as a medium for self-realization. The blurred box cover represents how people are finding an inner-spirit and harmony. It is unclear and difficult to define. Once we search in between the lines– the torn lining, clarity may be achieved. Once the box is opened, all becomes clear. Lucidity is found in the “blurred words”. The engraved message is re-written in clear legible writing. This represents the move from inner confusion to understanding. Human beings constitute a fragmented whole. This implies an elusiveness about human nature and its expression. Without questions, where is individuality? The liberation of the “self” allows change, progress. With rigorous self examination, pieces of the “puzzle of life” penetrate the surface. The box is an example of this. Women have access to their feelings. They are allowed to “own” them. Possession of thoughts, ideas, dreams are what this box characterizes. If we look back (rewind) we can understand why we are the way we are. The journey continues…..